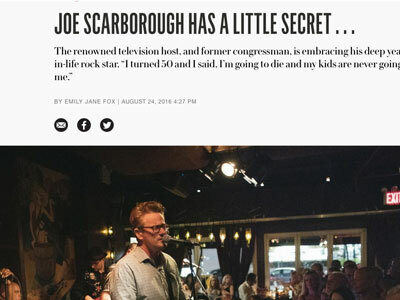 “Joe Scarborough Has a Little Secret” is the title of Emily Jane Fox‘s piece on the Morning Joe host, but no, Fox is not talking about Mika Brzezinski, Scarborough’s co-host who is rumored to be dating Scarborough. The secret is Scarborough’s lifelong passion for performing music, passion so intense it made his other pursuits, like legislating, feel of much lesser import, as when he was a U.S. congressman representing Florida’s 1st congressional district. I asked him how someone who ran for office, who served in Congress, and who hosts a daily cable news show could possibly still claim to be scared of judgment. Without a beat, he responded that music is the only thing he has ever really cared about professionally. “When I was in Congress, there were about 10 or 11 of us who were holdouts, who didn’t want to send troops to Bosnia. We were in this room with the president, the vice president, the secretary of state, the secretary of you name it. I sat there and could not have cared less. It just wasn’t what I valued,” he said, evincing a dry humor that seemed designed to amplify his inner musician. Hyperbolic flattery, it turns out, has as much appeal as hyperbolic fear-mongering, for the right audience.